You can easily transfer any domain to DreamPress that is currently using WordPress as a One-Click Install. Should you upgrade or import your site? Upgrading to DreamPress automatically switches the PHP version on your domain to PHP 7. If you do not need to test your site first, proceed to the following instructions to upgrade it directly to DreamPress. What happens to your current hosting plan when upgrading? 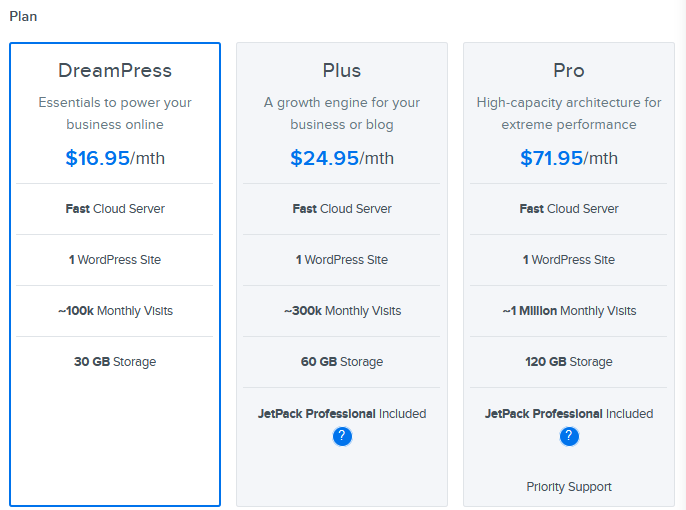 If your WordPress site is on a Shared, VPS, or Dedicated hosting plan, upgrading to DreamPress only adds a new DreamPress plan. It does not remove your old hosting plan, which means you'll still be paying for the old plan as well as the new DreamPress plan. If you have only one website, you can cancel your existing hosting plan since you will only be using the DreamPress plan going forward. If you have multiple websites on the old hosting plan, you must keep it active. 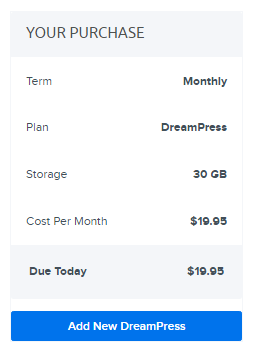 Purchasing a DreamPress plan creates a new hosting plan that's billed separately from any other hosting plan you may have. Any previous balance on another hosting plan does not transfer to the new DreamPress plan. Also, any files currently in your primary directory will be deleted. Make sure to backup any necessary files before upgrading. Click the blue Pick Your DreamPress Plan button. Click the 'Domains on Account' toggle link, and then select a DreamHost-hosted domain from the drop-down list (shown as "WordPress" next to a domain). Select either 'Annually' or 'Monthly' payment plan. When finished, click the blue Add New DreamPress button. After you add DreamPress, a success message displays on your dashboard page confirming that DreamPress is added to your domain. What if I don't have a One-Click Install of Wordpress? If you're not using a One-Click Install of Wordpress, and wish to upgrade to DreamPress, you can contact support who will help you convert your existing WordPress site to a One-Click Install. How do I import existing content into DreamPress? Article last updated March 24, 2019 19:30 PST.